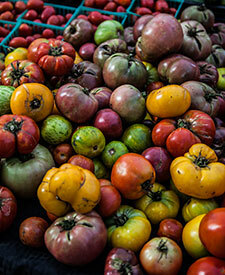 What's So Special About Heirloom Tomatoes? 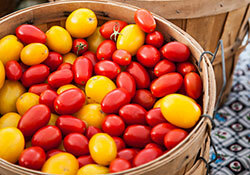 What's so special about heirloom tomatoes? In a world where flavor and color are sacrificed for uniform, homogenous tomatoes bred for their ability to withstand the rigors of long-distance shipping, locally-grown, proudly diverse, and shockingly flavorful tomatoes are a precious rarity. And they're worth the wait. 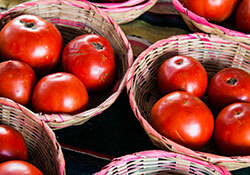 We are willing to forgo fresh tomatoes (often sad, forgettable rounds of pale pink on a sandwich or in a salad) all year for the pleasures of a sun-ripened, carefully-tended real tomato, either tart or a little sweet, dripping with juice and full of character and complexity. 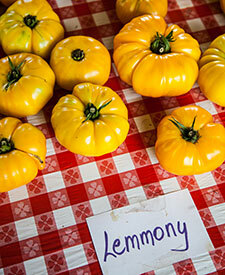 Farmers have their favorite varieties, and they'll tell you all about them. Here's a list of some of our favorites we've spied recently at SFC Farmers' Markets--now is the time to visit, try them all, and choose your favorites! The incredible abundance of summer produce brings with it just a wee bit of anxiety. We know all this ripe, juicy flavor is only around for a limited time, so how do we make the most of it? 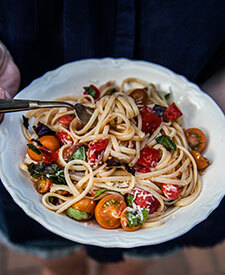 Certainly with recipes like this simplest of pastas--a true celebration of pure, powerful tomato flavor, accented with not much more than basil, garlic, and fruity olive oil. But what to do with what's left--the pounds of tomatoes getting riper by the moment, with more than we can eat getting red on the vine by the day? In November, all this will be a distant memory, and we'll wonder why we didn't appreciate it more while we could. Not to fret--we have the answer! Eat all you can, and relax: preserving the best of the season is easier than you might imagine. 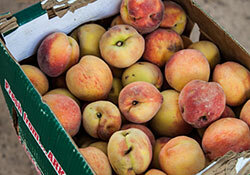 Love local food and community and want to spread the word about it? Eat gelato with Teo in Italy! Buy Confituras and support our friends at Urban Roots! Part of the proceeds of the Confituras Plum Orange Blossom Preserves (made with plums from the Urban Roots Farm) go straight back to the organization to support their mission of creating opportunities for at-risk youth and increasing food access for our community. 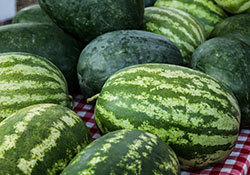 Join vendor, fishmonger, and salsa diva Yvonne at SFC Farmers’ Market at Sunset Valley this Saturday to taste and get the recipes for Vagan Calabacitas, Watermelon Salad, and Snapper with Salsa Verde. This Saturday, we’ll be offering up samples of Fresh Tomato Salsa Crudo with Zucchini “Noodles” at both Downtown and Sunset Valley markets—stop by for a taste!